While out in K-Country, I also had the chance to do some long exposure photography. The photo below was after the first day of shooting various locations along Highway 40. This is Wedge Pond, the place we camped out at for both nights. We waited for the almost full moon to rise up high enough so it light the entire scene in front of us. I believe the exposure was about 140 seconds @ F/7.1 and 1250 ISO. “Whispy Clouds” Kananaskis Country, Alberta. 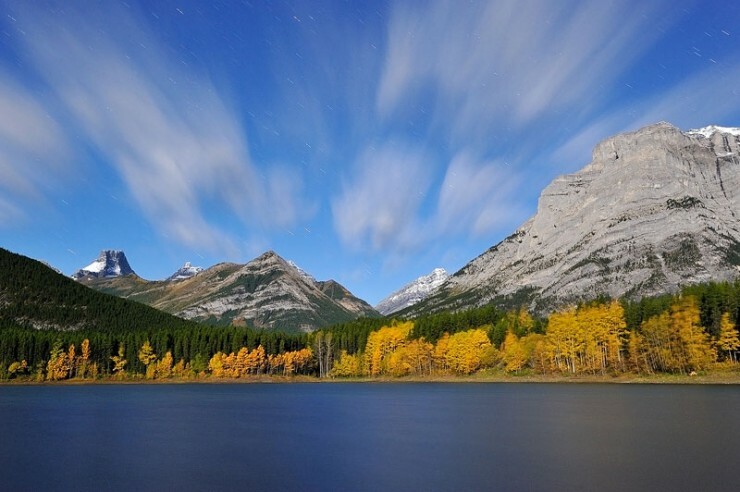 Written by Mike Isaak, posted on October 26, 2010 at 3:36 pm, in Kananaskis and tagged alberta, canada, long exposure, moonrise, night photography, rocky mountains, stars. Permalink. RSS feed for this post.